KATIE: Don't even think it, Waffles. I totally see you. WAFFLES: Really? But what about my invisible super powers? Aren't I invisible? KATIE: One can only wish. WAFFLES: C'mon, Boss. What's the password? WAFFLES: NO, password's not the password. You're never supposed to use password as your password. Everybody knows that. What's the password? KATIE: I'M not coming inside that thing with you. WAFFLES: Well no, not if you don't know the password. What's the password? KATIE: Fine. I need a hint though. WAFFLES: What's your mother's maiden name? 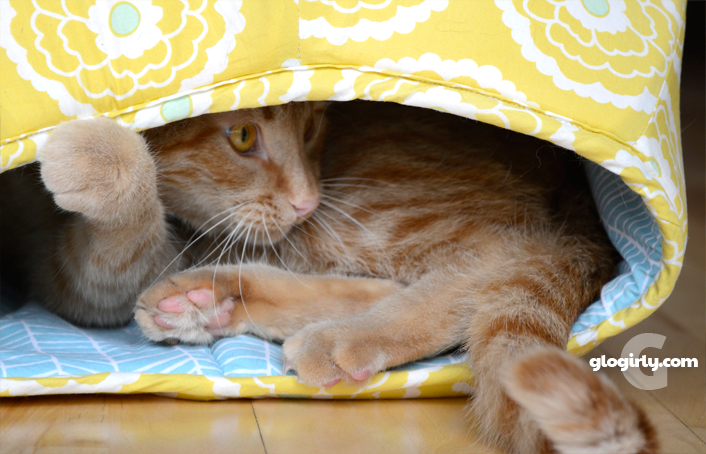 The cat-inspired folks at Muse by Purina® asked Glogirly to share with our friends and readers how Katie & Waffles inspire her. Just how exactly does she come up with their silly antics and dialogue? 1. In Greek mythology, the Muses were nine goddesses who symbolized the arts and sciences. Today, a muse is a person ( or CAT ) who serves as an artist's (or CAT Lover's) inspiration. b. Waffles, i.e. sorry, there is no documented translation for Waffles. Glogirly has always been inspired and amused by cats. From their light-footed grace to their olympian-like playing & hunting prowess, to their mad napping skills... she's been in awe (and just a little bit jealous) of cats her whole life. But it wasn't until she started blogging, way back in 2009, that she realized there was something more. Not knowing where to start or what to write, her husband (the now semi-infamous Gloman) suggested she let her cat do the talking. "Just write in Katie's voice." Well it stuck. All these years, Glogirly has barely muttered a word on the blog. Good thing too because Katie & Waffles are WAY more interesting. Every single day, Katie and Waffles get into something that inspires Glogirly. And if she's lucky, she's got her camera in hand. Sometimes it's just a look or glance between them. Other times it's a tag team breach of the treat cabinet in the kitchen. No matter what they're doing or what they've done, she's always imagining their conversation. Waffles has more expressions than any cat Glogirly's ever met. Most of which are silly and goofy. He's the consummate teenager, or more often toddler. An innocent trouble maker too cute to ever be mad at. King of Crazy. Katie is Waffles' counterpoint. Queen of the deadpan stare, a sarcastic and quick wit just oozes from her stylish tuxedo coat. She's delicate and ladylike, but watch out for her right hook. Chances are you'll never see it coming. 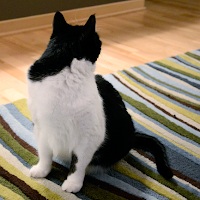 Oh, and note to Waffles: Yes, as a matter of fact she DOES have eyes in the back of her head. 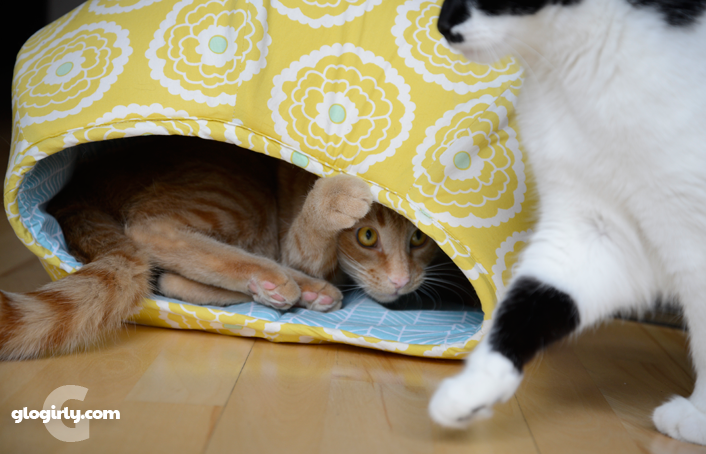 Katie & Waffles are polar opposites and purr-fect muses. New and only at PetSmart, Muse is their latest line of natural cat food. Broths, patés, chowders and toppers... 18 recipes in all, there's a variety of tastes and textures to choose from. Though our mainstay is a whole food diet, we really enjoy using canned and broth-type foods as special treats and snacks. For us, it's a nice alternative to dry treats or kibble. Waffles really enjoyed the toppers and Katie's favorite was the Natural Chicken Recipe Paté. ...she's a paté -girl at heart. 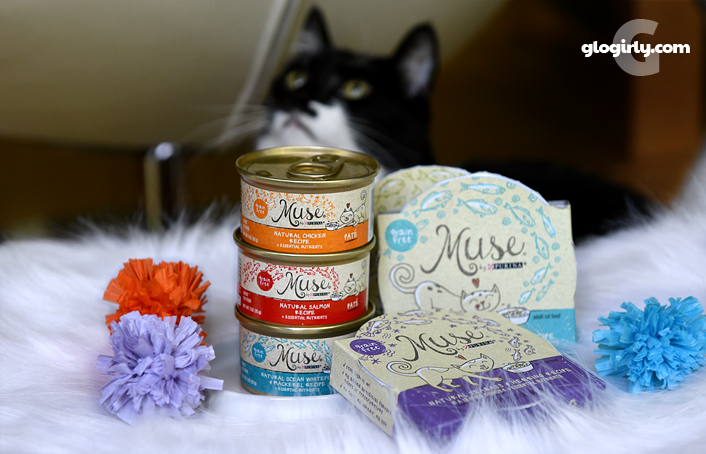 Learn more about Muse and join the conversation by sharing your own feline inspiration at MuseCatFood.com. FTC Disclosure: This post is sponsored by Muse by Purina and PetSmart. We received free product samples to try out as well and were paid to feature this content. Regardless of product and payment received, all sponsored posts on GLOGIRLY will always reflect our honest opinions and feature products we use or believe would be relevant to our friends and readers. Where would we be without our silly kitties? Waffles and Katie - yes true to the word - Muse and a delight as well. Waffles, I think you need some password lessons! Katie & Waffles are definitely muses! Es, you are o ear cute in that ct bed. Katie you are a vey good girl to put up with I his antics. Together you re a force to be reckoned with. 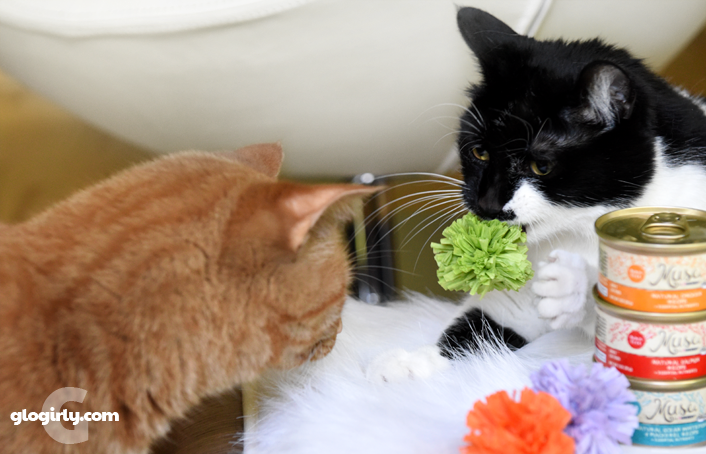 We just love you both"
Waffles and Katie are the purrfect muses!!! Waffles maybe you should go and have a nap and maybe when you wake up you'll remember the password. and very wonderful muses....mom says she often wonders what we are thinking - especially when Daiquiri is off on an adventure around here. No one has a club house here. We all like to lie on the rug and stretch out... Well, okay I use the beds. All of the beds. Not at one though. Cats are endlessly fascinating and Waffles and Katie are prime examples! 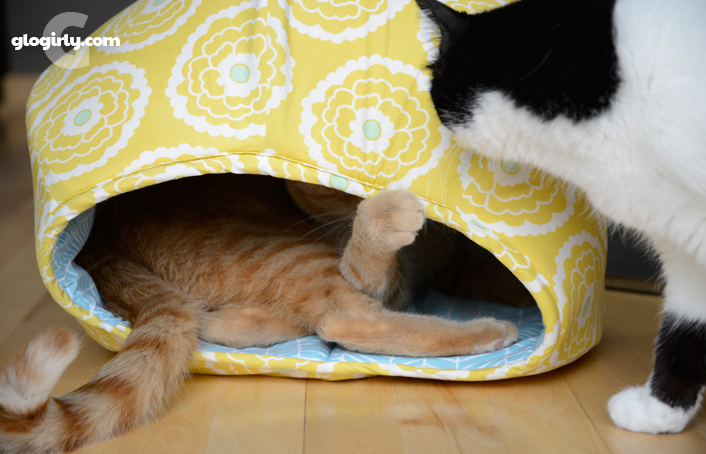 Waff, we don't think you're going to get away with a "no girlcats allowed" rule in your clubhouse. Our cats are the greatest muse ever! Katie is the YIN..Waffles is the YANG..together they are in perfect balance..and the perfect muses for Glogirly's creative mind..
We kitties try to inspire you to communicate for us. Our paws don't type well. I am sure Glorgirly's mind is going a mile a minute all day while she watches both cats. Cute, creative stuff. As always y'all look adowable. Dat's innewestin' weez not heard of da muse line afur. Hope y'all have a gweat weekend. Whoa! That Purina is really busy creating new recipes. I’m a fan of the Katie stare. Great post - really enjoyed learning how Katie and Waffles inspire your writing! Purr from Deb and the Zee/Zoey gang! You two are the purrfect muses! We made the mom bean check Petsmart for that kitty food, and we is sad to say they don't sell it in Canada. Silly beans, maybe the think kitties north of the border wouldn't like it.